KVERT reported that weak seismic activity at Kizimen continued during 29 November-6 December. Video showed gas-and-steam activity, and satellite images detected a daily weak thermal anomaly. On 9 December the Alert Level was lowered to Green. On 28 July 2014 KVERT (the Kamchatka Volcanic Eruptions Response Team) listed the recent Kizimen eruption as occurring during the interval 9 December 2010 to 9 December 2013 without any subsequent unrest. Our previous report (BGVN 38:04) noted seismicity, lava flows, ash plumes, and occasional pyroclastic flows during October 2011 to May 2013. In this report we note that the eruption continued, although lava extrusion was diminished, at least through mid-September 2013. After that time, the eruption became weak and ended on 9 December 2013. MODVOLC thermal alerts ceased during 12 July 2013 to at least as late as 25 July 2014. According to KVERT, moderate seismic activity continued during 31 May-13 September 2013. Video and satellite data showed that lava continued to extrude from the summit during this time, producing incandescence, strong gas-and-steam activity, and hot avalanches on the W and E flanks. The Aviation Color Code remained at Orange (Level 3 of 4; Aviation Color Codes are described more fully in figure 16 in BGVN 38:04). By mid-September 2013, activity had decreased. KVERT reported that both video and satellite data indicated less incandescence from the crater during the previous few weeks, and seismicity had decreased significantly by the end of August 2013. Lava may have continued to extrude from the crater at a low rate. On 13 September 2013, the Aviation Color Code was lowered to Yellow (Level 2). According to KVERT, weak seismic activity continued during 29 November-6 December 2013. Video showed gas-and-steam activity and satellite images showed a weak thermal anomaly on a daily basis; those anomalies were probably too weak to trigger a MODVOLC thermal alert. On 9 December 2013, the Alert Level was lowered to Green. The number of MODVOLC thermal alerts was relatively low through May 2013 (see figure 17 in BGVN 38:04), and during 2013 decreased further during the months of June (7 alerts), July (2 alerts), and August (6 alerts). From 12 July 2013 through 15 July 2014, MODVOLC thermal alerts were absent. Two natural-color images of Kizimen collected by the Operational Land Imager on Landsat 8 appear in figures 20 and 21. The respective images depict seasonal changes from early fall 2013 to late spring 2014 and show ongoing steam emission on 17 June 2014. Figure 20. NASA Earth Observatory satellite photo showing Kizimen partly covered in snow on 2 September 2013. A diffuse white plume drifted SE from the summit. The branching lava flow on the E flank began forming in September 2011. Courtesy of Robert Simmon, NASA Earth Observatory. Figure 21. NASA Earth Observatory satellite photos showing Kizimen with considerable portions of the winter's snowpack absent on 17 June 2014. A white steam and gas plume drifted S from the summit volcano. Courtesy of Robert Simmon, NASA Earth Observatory. Information Contacts: Kamchatka Volcanic Eruptions Response Team (KVERT), Far East Division, Russian Academy of Sciences, 9 Piip Blvd., Petropavlovsk-Kamchatsky, 683006, Russia (URL: http://www.kscnet.ru/ivs/); MODVOLC - HIGP, Hawai'i Institute of Geophysics and Planetology (HIGP), MODVOLC Thermal Alerts System, School of Ocean and Earth Science and Technology (SOEST), Univ. of Hawai'i, 2525 Correa Road, Honolulu, HI 96822, USA (URL: http://modis.higp.hawaii.edu/); and NASA Earth Observatory, EOS Project Science Office, NASA Goddard Space Flight Center, Goddard, Maryland, USA (URL: http://earthobservatory.nasa.gov/). KVERT reported that during 6-13 September moderate seismic activity continued at Kizimen. Video and satellite data showed that lava continued to extrude from the summit, producing incandescence, strong gas-and-steam activity, and hot avalanches on the W and E flanks. A thermal anomaly was detected in satellite images during 8-11 September; cloud cover obscured views on the other days. On 13 September KVERT noted that activity had been decreasing; both video and satellite data indicated less incandescence from the crater over the past few weeks, and seismicity had decreased significantly at the end of August. Lava possibly continued to extrude from the crater at a low rate. The Aviation Color Code was lowered to Yellow. KVERT reported that during 30 August-6 September moderate seismic activity continued at Kizimen. Video and satellite data showed that lava continued to extrude from the summit, producing incandescence, strong gas-and-steam activity, and hot avalanches on the W and E flanks. A thermal anomaly was detected in satellite images on 2 and 5 September; cloud cover obscured views on the other days. The Aviation Color Code remained at Orange. KVERT reported that during 23-30 August moderate seismic activity continued at Kizimen. Video and satellite data showed that lava continued to extrude from the summit, producing incandescence, strong gas-and-steam activity, and hot avalanches on the W and E flanks. A thermal anomaly was detected daily in satellite images. The Aviation Color Code remained at Orange. KVERT reported that during 16-23 August moderate seismic activity continued at Kizimen. Video and satellite data showed that lava continued to extrude from the summit, producing incandescence, strong gas-and-steam activity, and hot avalanches on the W and E flanks. A thermal anomaly was detected in satellite images during 16-18 and 20-23 August; cloud cover obscured views on 19 August. The Aviation Color Code remained at Orange. KVERT reported that during 9-17 August moderate seismic activity continued at Kizimen. Video and satellite data showed that lava continued to extrude from the summit, producing incandescence, strong gas-and-steam activity, and hot avalanches on the W and E flanks. A thermal anomaly was detected in satellite images during 10-12 August; cloud cover obscured views on the other days. The Aviation Color Code remained at Orange. KVERT reported that during 2-9 August moderate seismic activity continued at Kizimen. Video and satellite data showed that lava continued to extrude from the summit, producing incandescence, strong gas-and-steam activity, and hot avalanches on the W and E flanks. A thermal anomaly was detected in satellite images during 2-6 August; cloud cover obscured views on the other days. The Aviation Color Code remained at Orange. KVERT reported that during 26 July-2 August moderate seismic activity continued at Kizimen. Video and satellite data showed that lava continued to extrude from the summit, producing incandescence, strong gas-and-steam activity, and hot avalanches on the W and E flanks. A thermal anomaly was detected in satellite images during 29-31 July; cloud cover obscured views on the other days. The Aviation Color Code remained at Orange. KVERT reported that during 19-26 July moderate seismic activity continued at Kizimen. Video and satellite data showed that lava continued to extrude from the summit, producing incandescence, strong gas-and-steam activity, and hot avalanches on the W and E flanks. A thermal anomaly was detected in satellite images during 19-20 and 23 July; cloud cover obscured views on the other days. The Aviation Color Code remained at Orange. KVERT reported that during 12-19 July moderate seismic activity continued at Kizimen. Video and satellite data showed that lava continued to extrude from the summit, producing incandescence, strong gas-and-steam activity, and hot avalanches on the W and E flanks. A thermal anomaly was detected in satellite images during 15-18 July. The Aviation Color Code remained at Orange. KVERT reported that during 5-12 July moderate seismic activity continued at Kizimen. Video and satellite data showed that lava continued to extrude from the summit, producing incandescence, strong gas-and-steam activity, and hot avalanches on the W and E flanks. A thermal anomaly was detected in satellite images on 5 and 9 July. The Aviation Color Code remained at Orange. KVERT reported that during 28 June-5 July moderate seismic activity continued at Kizimen. Video and satellite data showed that lava continued to extrude from the summit, producing incandescence, strong gas-and-steam activity, and hot avalanches on the W and E flanks. A thermal anomaly was detected in satellite images on 28 June, and during 1 and 3-4 July. The Aviation Color Code remained at Orange. KVERT reported that during 21-28 June moderate seismic activity continued at Kizimen. Video and satellite data showed that lava continued to extrude from the summit, producing incandescence, strong gas-and-steam activity, and hot avalanches on the W and E flanks. A thermal anomaly was detected in satellite images during 21-23 June; cloud cover prevented views of the volcano on the other days. The Aviation Color Code remained at Orange. KVERT reported that during 14-21 June moderate seismic activity continued at Kizimen. Video and satellite data showed that lava continued to extrude from the summit, producing incandescence, strong gas-and-steam activity, and hot avalanches on the W and E flanks. A thermal anomaly was detected in satellite images during 14-17 and 20 June. The Aviation Color Code remained at Orange. KVERT reported that during 7-14 June moderate seismic activity continued at Kizimen. Video and satellite data showed that lava continued to extrude from the summit, producing incandescence, strong gas-and-steam activity, and hot avalanches on the W and E flanks. A thermal anomaly was detected in satellite images during 8, 10, and 12-13 June. The Aviation Color Code remained at Orange. KVERT reported that during 24-31 May moderate seismic activity continued at Kizimen. Video and satellite data showed that lava continued to extrude from the summit, producing incandescence, strong gas-and-steam activity, and hot avalanches on the W and E flanks. A thermal anomaly was detected daily in satellite images. The Aviation Color Code remained at Orange. KVERT reported that during 17-24 May moderate seismic activity continued at Kizimen. Video and satellite data showed that lava continued to extrude from the summit, producing incandescence, strong gas-and-steam activity, and hot avalanches on the W and E flanks. A thermal anomaly was detected daily in satellite images. The Aviation Color Code remained at Orange. KVERT reported that during 10-16 May moderate seismic activity continued at Kizimen. Video and satellite data showed that lava continued to extrude from the summit, producing incandescence, strong gas-and-steam activity, and hot avalanches on the W and E flanks. A thermal anomaly was detected daily in satellite images. The Aviation Color Code remained at Orange. KVERT reported that during 3-10 May moderate seismic activity continued at Kizimen. Video and satellite data showed that lava continued to extrude from the summit, producing incandescence, strong gas-and-steam activity, and hot avalanches on the W and E flanks. A thermal anomaly was detected daily in satellite images. The Aviation Color Code remained at Orange. KVERT reported that during 19-26 April moderate seismic activity continued at Kizimen. Video and satellite data showed that lava continued to extrude from the summit, producing incandescence, strong gas-and-steam activity, and hot avalanches on the W and E flanks. Cloud-free satellite images detected a thermal anomaly over the volcano. The Aviation Color Code remained at Orange. KVERT reported that during 12-19 April moderate seismic activity continued at Kizimen. Video and satellite data showed that lava continued to extrude from the summit, producing incandescence, strong gas-and-steam activity, and hot avalanches on the W and E flanks. Satellite images detected a daily thermal anomaly over the volcano. The Aviation Color Code remained at Orange. KVERT reported that during 5-12 April moderate seismic activity continued at Kizimen. Video and satellite data showed that lava continued to extrude from the summit, producing incandescence, strong gas-and-steam activity, and hot avalanches on the W and E flanks. Satellite images detected a daily thermal anomaly over the volcano. The Aviation Color Code remained at Orange. KVERT reported that during 29 March-5 April moderate seismic activity continued at Kizimen. Video and satellite data showed that lava continued to extrude from the summit, producing incandescence, strong gas-and-steam activity, and hot avalanches on the W and E flanks. Satellite images detected a daily thermal anomaly over the volcano. Based on information from Yelizovo Airport (UHPP) and analysis of satellite imagery, the Tokyo VAAC reported that an ash plume rose to an altitude of 4.6 km (15,000 ft) a.s.l. and drifted S on 4 April. The Aviation Color Code remained at Orange. KVERT reported that during 22-29 March moderate seismic activity continued at Kizimen. Video and satellite data showed that lava continued to extrude from the summit, producing incandescence, strong gas-and-steam activity, and hot avalanches on the W and E flanks. Satellite images detected a daily thermal anomaly over the volcano. The Aviation Color Code remained at Orange. KVERT reported that during 15-22 March moderate seismic activity continued at Kizimen. Video and satellite data showed that lava continued to extrude from the summit, producing summit incandescence, strong gas-and-steam activity, and hot avalanches on the W and E flanks. Satellite images detected a thermal anomaly over the volcano during 15-18 and 21 March. The Aviation Color Code remained at Orange. KVERT reported that during 8-15 March moderate seismic activity continued at Kizimen. Video data showed that lava continued to extrude from the summit, producing summit incandescence, strong gas-and-steam activity, and hot avalanches on the W and E flanks. Satellite images detected a daily thermal anomaly over the volcano. The Aviation Color Code remained at Orange. KVERT reported that during 22 February-1 March moderate seismic activity continued at Kizimen. Video data showed that lava continued to extrude from the summit, producing summit incandescence, strong gas-and-steam activity, and hot avalanches on the W and E flanks. Satellite images detected a daily thermal anomaly over the volcano. The Aviation Color Code remained at Orange. KVERT reported that during 15-22 February moderate seismic activity continued at Kizimen. Video data showed that lava continued to extrude from the summit, producing summit incandescence, strong gas-and-steam activity, and hot avalanches on the W and E flanks. Satellite images detected a daily thermal anomaly over the volcano. The Aviation Color Code remained at Orange. KVERT reported that during 8-15 February moderate seismic activity continued at Kizimen. Video data showed that lava continued to extrude from the summit, producing summit incandescence, strong gas-and-steam activity, and hot avalanches on the W and E flanks. Satellite images detected a daily thermal anomaly over the volcano. The Aviation Color Code remained at Orange. KVERT reported that during 25 January-1 February moderate seismic activity continued at Kizimen. Video data showed that lava continued to extrude from the summit onto the E and SE flanks. Summit incandescence, strong gas-and-steam activity, and occasional hot avalanches on the W and E flanks accompanied the process. Satellite images detected a daily thermal anomaly over the volcano. The Aviation Color Code remained at Orange. KVERT reported that during 18-25 January moderate seismic activity continued at Kizimen. Video data showed that lava continued to extrude from the summit onto the E and SE flanks. Summit incandescence, strong gas-and-steam activity, and occasional hot avalanches on the W and E flanks accompanied the process. Satellite images detected a daily thermal anomaly over the volcano. The Aviation Color Code remained at Orange. KVERT reported that during 11-18 January moderate seismic activity continued at Kizimen. Video data showed that lava continued to extrude from the summit onto the E flank. Summit incandescence, strong gas-and-steam activity, and occasional hot avalanches on the W and E flanks accompanied the process. Satellite images detected two new lava flows on the SE flank and a thermal anomaly over the volcano during 10-15 January. The Aviation Color Code remained at Orange. KVERT reported that during 4-11 January moderate seismic activity at Kizimen continued. Video data showed that lava continued to extrude from the summit onto the NE flank. Summit incandescence, strong gas-and-steam activity, and occasional hot avalanches on the W and E flank accompanied the process. Satellite images detected a daily thermal anomaly over the volcano. The Aviation Color Code remained at Orange. Based on information from the Kamchatkan Branch of Geophysical Services (KGBS), the Tokyo VAAC reported that ash plumes rose to an altitude over 5.2 km (17,000 ft) a.s.l. on 11 January and over 4.6 km (15,000 ft) a.s.l. on 13 January. KVERT reported that on 27 December the eruption at Kizimen had ceased; video data occasionally recorded summit incandescence and satellite imagery detected a thermal anomaly that gradually decreased in intensity. The Aviation Color Code was lowered to Green. Seismic activity increased on 28 December. Video data showed a new lava flow extruding from the summit onto the NE flank. During 28 December-7 January summit incandescence, strong gas-and-steam activity, and occasional hot avalanches on the W and E flank accompanied the process. Satellite images detected a thermal anomaly over the volcano. The Aviation Color Code was raised to Orange on 31 December. KVERT reported that seismic activity at Kizimen had gradually decreased. Video data showed incandescence from the crater and moderate gas-and-steam activity. Satellite images detected a thermal anomaly over the volcano but the intensity of the anomaly had also gradually decreased. On 12 December the Aviation Color Code was lowered to Yellow. KVERT reported that during 30 November-7 December weak-to-moderate seismic activity at Kizimen was detected. Video and satellite images showed lava flows effusing from the summit and the E flank, summit incandescence, strong gas-and-steam activity, and hot avalanches on the S flank. A thermal anomaly was detected in satellite images during 1 and 4-7 December; cloud cover obscured views on the other days. The Aviation Color Code remained at Orange. KVERT reported that during 23-30 November moderate seismic activity at Kizimen was detected. Video and satellite images showed lava flows effusing from the summit and the E flank, summit incandescence, strong gas-and-steam activity, and hot avalanches on the S flank. A thermal anomaly was detected in satellite images during 23-26 and 29 November; cloud cover obscured views on the other days. The Aviation Color Code remained at Orange. KVERT reported that during 16-23 November moderate seismic activity at Kizimen was detected. Video and satellite images showed lava flows effusing from the summit and the E flank, summit incandescence, strong gas-and-steam activity, and hot avalanches on the S flank. A thermal anomaly was detected in satellite images on 17, 20, and 22 November; cloud cover obscured views on the other days. The Aviation Color Code remained at Orange. KVERT reported that during 9-16 November moderate seismic activity at Kizimen was detected. Video and satellite images showed lava flows effusing from the summit and the E flank, summit incandescence, strong gas-and-steam activity, and hot avalanches on the S flank. A daily thermal anomaly was detected in satellite images. The Aviation Color Code remained at Orange. KVERT reported that during 2-9 November moderate seismic activity at Kizimen was detected. Video and satellite images showed lava flows effusing from the summit and the E flank, summit incandescence, strong gas-and-steam activity, and hot avalanches on the S flank. During 1-2 and 6-7 November a thermal anomaly was detected in satellite images. The Aviation Color Code remained at Orange. KVERT reported that during 26 October-2 November moderate seismic activity at Kizimen was detected along with a thermal anomaly in satellite imagery. Video and satellite images showed lava flows effusing from the summit and the E flank, summit incandescence, strong gas-and-steam activity, and hot avalanches on the S flank. The Aviation Color Code was raised to Orange on 1 November. Based on information from the Kamchatka Branch of Geophysical Services (KGBS), the Tokyo VAAC reported that an ash plume drifted NE at an altitude of 5.2 km (17,000 ft) a.s.l. on 2 November. KVERT reported that during 2-3 November moderate seismicity indicated that possible ash plumes rose to altitudes of 4.5-4.8 km (14,800-15,800 ft) a.s.l. Video images showed gas-and-steam activity during 2-5 November. Incandescence above the crater and lava flow were observed on 5 November. KVERT reported moderate seismic activity at Kizimen during 16-23 March and a large thermal anomaly that was detected in satellite images. Video and satellite observations indicated both continued effusion of a large lava flow on the E flank and accompanying hot avalanches. Strong gas-and-steam activity was observed with the video camera. The Aviation Color Code remained at Orange. KVERT reported moderate seismic activity at Kizimen during 9-16 March and a large thermal anomaly that was detected in satellite images. Video and satellite observations indicated both continued effusion of a large lava flow on the E flank and hot avalanches. Strong gas-and-steam activity was observed with the video camera. The Aviation Color Code remained at Orange. KVERT reported moderate seismic activity at Kizimen during 2-9 March and a large thermal anomaly that was detected in satellite images. Video and satellite observations indicated both continued effusion of a large lava flow on the E flank and hot avalanches. The Aviation Color Code remained at Orange. KVERT reported moderate seismic activity at Kizimen during 24 February-2 March and a large thermal anomaly that was detected in satellite images on most days. Video and satellite observations indicated both continued effusion of a large lava flow on the E flank and hot avalanches. Video data also showed strong gas-and-steam activity. The Aviation Color Code remained at Orange. During 17-24 February, KVERT reported moderate seismicity at Kizimen, strong gas-and-steam activity, and a large thermal anomaly that was detected daily in satellite images. Video and satellite observations indicated both continued effusion of a large lava flow on the E flank and accompanying hot avalanches. A large avalanche on the E flank, W of the lava flow, was observed on 21 February, and an ash plume rose to an altitude of 1 km (3,280 ft) a.s.l. On 22 February about 20 avalanches were reported. The Aviation Color Code remained at Orange. KVERT reported moderate seismic activity at Kizimen during 10-17 February and a large thermal anomaly that was detected daily in satellite images. Video and satellite observations indicated both continued effusion of a large lava flow on the E flank and accompanying hot avalanches. Video data showed strong gas-and-steam activity all week. The Aviation Color Code remained at Orange. KVERT reported moderate seismic activity at Kizimen during 3-10 February and a large thermal anomaly that was detected daily in satellite images. Video and satellite observations indicated both continued effusion of a large lava flow on the E flank and accompanying hot avalanches. Video data showed strong gas-and-steam activity all week. The Aviation Color Code remained at Orange. KVERT reported moderate seismic activity at Kizimen during 27 January-3 February and a large thermal anomaly that was detected daily in satellite images. Video and satellite observations indicated both continued effusion of a large lava flow on the E flank and accompanying hot avalanches. Video data showed strong gas-and-steam activity all week. The Aviation Color Code remained at Orange. KVERT reported moderate seismic activity at Kizimen during 20-27 January and a large thermal anomaly that was detected daily in satellite images. Video and satellite observations indicated both continued effusion of a large lava flow on the E flank and accompanying hot avalanches. Video data showed strong gas-and-steam activity all week. The Aviation Color Code remained at Orange. KVERT reported moderate seismic activity at Kizimen during 13-20 January and a large thermal anomaly that was detected daily in satellite images. Video and satellite observations indicated both continued effusion of a large lava flow on the E flank and accompanying hot avalanches. Video data showed strong gas-and-steam activity all week. The Aviation Color Code remained at Orange. KVERT reported moderate seismic activity at Kizimen during 6-13 January and a large thermal anomaly that was detected daily in satellite images. Video and satellite observations indicated both continued effusion of a large lava flow on the E flank and accompanying hot avalanches. Video data showed strong gas-and-steam activity all week, and on 11 January satellite images showed a gas-and-steam plume that drifted 40 km E. The Aviation Color Code remained at Orange. KVERT reported moderate seismic activity at Kizimen during 30 December-6 January and a large thermal anomaly that was detected daily in satellite images. Video and satellite observations indicated both continued effusion of a large lava flow on the E flank and hot avalanches. Video data also showed strong gas-and-steam activity. The Aviation Color Code remained at Orange. KVERT reported moderate seismic activity at Kizimen during 23-30 December and a large thermal anomaly that was detected daily in satellite images. Video and satellite observations indicated that a large lava flow on the E flank continued to effuse. Gas-and-steam plumes drifted 150 km N and 30 km SE on 24 and 27 December, respectively. The Aviation Color Code remained at Orange. Based on information from Yelizovo Airport (UHPP) and analysis of satellite imagery, the Tokyo VAAC reported that an ash plume rising to an altitude of 5.2 km (17,000 ft) a.s.l. drifted NW on 28 December. KVERT reported moderate seismic activity at Kizimen during 16-23 December. Satellite images showed a daily thermal anomaly and a gas-and-steam plume that drifted 65 km S on 20 December. Video observations showed a gas-and-steam plume that rose about 3.5-4 km a.s.l. on 27 December. A large lava flow on the NE and E flanks continued to effuse. The Aviation Color Code remained at Orange. Based on analyses of satellite imagery and information from KVERT, the Tokyo VAAC reported that on 24 December an ash plume rose to an altitude of 5.2 km (17,000 ft) a.s.l. and drifted NW. KVERT reported increased seismic activity at Kizimen during 9-16 December. A series of strong seismic events were detected during 0547-0628 on 14 December. Explosions possibly produced ash plumes that rose to an altitude of 7.5 km (24,600 ft) a.s.l. Video observations showed hot avalanches from the lava flow and occasional large pyroclastic flows. During 0620-0810 a large pyroclastic flow with co-ignimbrite clouds was observed. Satellite images showed a thermal anomaly on the volcano all week and a gas-and-steam plume with ash from the pyroclastic flows that drifted 150 km during 13-14 December. A large lava flow on the NE and E flanks continued to effuse. The Aviation Color Code remained at Orange. The Tokyo VAAC reported that on 14 December an eruption detected in satellite imagery produced ash plumes that rose to altitudes of 6.1-7.6 km (20-25,000 ft) a.s.l. and drifted E. Subsequent notices stated that ash emissions which continued later that day dissipated on 15 December. KVERT reported an increase in seismic activity at Kizimen during 2-9 December and a daily thermal anomaly that was detected in satellite images. A large lava flow on the NE and E flanks continued to effuse. The video camera was down due to technical reasons during the week. The Aviation Color Code remained at Orange. KVERT reported a decrease in seismic activity at Kizimen during 25 November-2 December and a thermal anomaly that was detected daily in satellite images. A large lava flow on the NE and E flanks continued to effuse. The video camera was down due to technical reasons during the week. Pilot reports indicated gas-and-steam activity during 27-28 November and plumes rose to an altitude of 5 km (16,400 ft) a.s.l. The Aviation Color Code remained at Orange. KVERT reported moderate seismic activity at Kizimen during 18-25 November and a thermal anomaly that was detected daily in satellite images. A large lava flow on the NE and E flanks continued to effuse, and the crater was occasionally incandescent at night. Video observations showed gas-and-steam activity during 20 and 22-24 November. The Aviation Color Code remained at Orange. KVERT reported moderate seismic activity at Kizimen during 10-18 November and a thermal anomaly that was detected on 11-14 and 17 November in satellite images. Video observations showed gas-and-steam activity during 10 and 13-14 November. A large lava flow on the NE and E flanks continued to effuse, and the crater was incandescent at night during 13-14 November. The Aviation Color Code remained at Orange. KVERT reported moderate seismic activity at Kizimen during 4-11 November and that a thermal anomaly on the volcano was detected daily in satellite images. A large lava flow on the NE and E flanks continued to effuse and the crater was incandescent at night during 2-3 and 6-9 November. Video observations showed gas-and-steam activity during 4-9 November. The Aviation Color Code remained at Orange. KVERT reported moderate seismic activity at Kizimen during 28 October-4 November; the number of volcanic earthquakes increased. A thermal anomaly on the volcano was detected daily in satellite images. A large lava flow on the NE and E flanks continued to effuse and was visibly incandescent at night. Video observations showed gas-and-steam activity during 28 October-2 November. A large lava flow on the NE flank continued to effuse, and incandescence from both the crater and the lava flows was noted at night. The Aviation Color Code remained at Orange. KVERT reported that during 21-28 October there was moderate seismic activity at Kizimen; the number of volcanic earthquakes decreased from 105 to 30 during 21-24 October. A thermal anomaly on the volcano was detected daily in satellite images. Video observations on 20 October showed a small pyroclastic flow on the NE flank and later ashfall on the flanks. Gas-and-steam activity was observed during 20-21 and 23-26 October. A large lava flow on the NE flank continued to effuse, and incandescence from both the lava flows and the crater was noted at night. The Aviation Color Code remained at Orange. KVERT reported that during 14-21 October the magnitudes of the volcanic earthquakes at Kizimen decreased, as well as the numbers, down to 22-60. Video data showed ashfall on the flanks during 14-15 October, and that a large lava flow on the NE flank continued to effuse. A thermal anomaly on the volcano was detected daily in satellite images. The Aviation Color Code remained at Orange. KVERT reported that during 7-14 October the magnitudes of the volcanic earthquakes at Kizimen decreased, as well as the numbers, from 500 to 100. Video data showed that a large lava flow on the NE flank continued to effuse and strong fumarolic activity was observed. A thermal anomaly on the volcano was detected daily in satellite images. The Aviation Color Code remained at Orange. KVERT reported that during 30 September-7 October video data showed that a large lava flow on Kizimen's NE flank continued to effuse. Strong fumarolic activity was observed during 29-30 September and 3-6 October. A thermal anomaly on the volcano was detected daily in satellite images but the temperature of the anomaly decreased during the end of the week. During 5-6 October the number of volcanic earthquakes decreased, from 1,300 to 500-700, as well as the magnitudes. The Aviation Color Code remained at Orange. KVERT reported that during 23-30 September seismicity at Kizimen remained high with 1,200-1,600 earthquakes recorded daily. A large thermal anomaly on the volcano was detected daily in satellite images. A large lava flow on the NE flank continued to effuse and strong fumarolic activity was observed. The Aviation Color Code remained at Orange. KVERT reported that during 16-23 September volcanic tremor magnitude at Kizimen continued to increase; 1,400-1,600 earthquakes were recorded daily. A thermal anomaly on the volcano was detected in satellite images. Lava on the E flank continued to flow and video images showed strong fumarolic activity. The Aviation Color Code remained at Orange. KVERT reported that during 9-15 September volcanic tremor magnitude at Kizimen continued to increase; 1,200-1,500 earthquakes were recorded daily. A thermal anomaly on the volcano was detected in satellite images. Lava on the E flank continued to flow and video images showed strong fumarolic activity. The Aviation Color Code remained at Orange. KVERT reported that during 26 August-1 September the number and magnitude of volcanic earthquakes at Kizimen continued to increase; about 1,000 earthquakes were detected daily. Satellite images showed a large bright thermal anomaly on the volcano all week and gas-and-steam plumes that drifted 60 km E on 26 and 29 August. Lava on the E flank continued to flow. In addition to strong fumarolic activity, video images from the previous week showed a new long fissure at the top of the volcano. The Aviation Color Code remained at Orange. KVERT reported that during 19-26 August seismicity from Kizimen was above background levels; volcanic-tremor magnitude gradually increased and several hundred earthquakes were detected the previous week. Video images showed moderate fumarolic activity. A lava flow on the E flank was active. Satellite images showed a large bright thermal anomaly on the volcano all week and gas-and-steam plumes that drifted E on 19 and 22 August. The Aviation Color Code remained at Orange. KVERT reported that during 12-19 August seismicity from Kizimen was above background levels and weak volcanic tremor continued to be detected. Video images showed an occasional steam plume that rose to an altitude of 3 km (9,800 ft) a.s.l. and fumarolic activity on 14 August. A lava flow on the E flank was active. Satellite images showed a large bright thermal anomaly on the volcano all week and a gas-and-steam plume that drifted 57 km NNE on 15 August. The Aviation Color Code remained at Orange. Based on analyses of satellite imagery, the Tokyo VAAC reported that a possible eruption on 20 August produced a plume that rose to an altitude of 4.3 km (14,000 ft) a.s.l. and drifted E. Subsequent images that day showed that continuing ash emissions had later dissipated. KVERT reported that during 5-12 August seismicity from Kizimen was above background levels and weak volcanic tremor continued to be detected. Video images showed fumarolic activity and an occasional steam-and-gas plume that rose to an altitude of 4 km (13,100 ft) a.s.l. A lava flow on the E flank remained active. Satellite images showed a bright thermal anomaly on the volcano all week. The Aviation Color Code remained at Orange. KVERT reported that during 29 July-5 August seismicity from Kizimen was above background levels and weak volcanic tremor continued to be detected. Video images showed fumarolic activity and an occasional steam plume that rose to an altitude of 4.5 km (14,800 ft) a.s.l. A lava flow on the E flank was active. Satellite images showed a bright thermal anomaly on the volcano all week. The Aviation Color Code remained at Orange. KVERT reported that photos taken of Kizimen on 20 July showed that the lava flow on the E flank, which began in January, remained active. During 22-29 July seismicity was above background levels and weak volcanic tremor continued to be detected. Satellite images showed a bright thermal anomaly on the volcano all week and seismic data indicated that possible ash plumes rose to an altitude of 3 km (10,000 ft) a.s.l. Seismologists in the area observed the active lava flow on the E flank. The Aviation Color Code remained at Orange. KVERT reported that during 15-22 July seismicity from Kizimen was above background levels and weak volcanic tremor continued to be detected. Satellite images showed a bright thermal anomaly on the volcano all week. Seismic data indicated that possible ash plumes rose to an altitude of 3.5 km (11,500 ft) a.s.l. during 19-20 July. A gas-and-steam plume detected in satellite imagery on 19 July drifted NW. Seismologists in the area on 20 July observed gas-and-ash plumes that rose to an altitude of 3 km (9,800 ft) a.s.l. and drifted 15 km E. The Aviation Color Code remained at Orange. KVERT reported that during 8-15 July seismicity from Kizimen was above background levels and volcanic tremor continued to be detected. Satellite images showed a bright thermal anomaly on the volcano all week. Seismic data indicated that possible ash plumes rose to an altitude of 3.3 km (10,800 ft) a.s.l. on 10 July. The Aviation Color Code remained at Orange. Based on information from Yelizovo Airport (UHPP), the Tokyo VAAC reported that on 19 July an ash plume rose to an altitude of 3 km (10,000 ft) a.s.l. and drifted NW. KVERT reported that during 1-8 July observers on Tolbachik's flanks noted strong fumarolic activity from Kizimen. Deformation was also noted on those days. During 1-8 July seismicity was above background levels and volcanic tremor continued to be detected. A bright thermal anomaly was detected in satellite imagery during 2-5 July; cloud cover prevented observations of the volcano on the other days. The Aviation Color Code remained at Orange. Based on information from Yelizovo Airport (UHPP), the Tokyo VAAC reported that on 12 July an ash plume rose to an altitude of 6.4 km (21,000 ft) a.s.l. and drifted E.
KVERT reported that during 24 June-1 July seismicity from Kizimen was above background levels and volcanic tremor continued to be detected. A thermal anomaly was detected in satellite imagery during 23-25, 28, and 30 June. The Aviation Color Code remained at Orange. KVERT reported that during 16-24 June seismicity from Kizimen was above background levels and volcanic tremor continued to be detected. Seismic data indicated that possible ash plumes rose to an altitude of 5.2 km (17,000 ft) a.s.l. during 16-17 June. Satellite images showed a thermal anomaly on the volcano during 17-18 and 20-21 June, and gas-and-steam plumes that drifted 200 km NW during 22-23 June. The Aviation Color Code remained at Orange. KVERT reported that during 3-10 June seismicity from Kizimen was above background levels and strong tremor continued to be detected. Seismic data indicated that possible ash plumes rose to an altitude of 6.6 km (21,700 ft) a.s.l. during 5-8 June. Satellite images showed a large bright thermal anomaly on the volcano during 3-5, 7, and 9 June, and an ash plume that rose to an altitude of 5 km (16,400 ft) a.s.l. on 9 June. During 11-12 June seismicity significantly increased. Seismic data indicated 10 strong explosions and ash plumes that rose to altitudes of 4-5.9 km (13,120-19,350 ft) a.s.l. Satellite imagery showed a wide ash plume that drifted 135 km SE and a large bright thermal anomaly. The Aviation Color Code was raised to Red. On 12 June volcanic tremor magnitude decreased, then sharply decreased about 4 hours later. The next day ash plumes observed in satellite imagery drifted 760 km E at altitudes that did not exceed 5.9 km (19,350) a.s.l. A large bright thermal anomaly continued to be detected. Volcanic-tremor magnitude again increased for about a three-hour period, then decreased and remained low on 14 June. Satellite imagery from that day showed a large pyroclastic flow deposit on the NE flank from 11-13 June activity. An ash plume drifted 26 km S on 15 June. KVERT reported that during 27 May-3 June seismicity from Kizimen was above background levels and strong tremor continued to be detected. Seismic data indicated that possible ash plumes rose to an altitude of 6 km (19,700 ft) a.s.l. Satellite images showed a large bright thermal anomaly daily on the volcano. The Aviation Color Code remained at Orange. Based on information from KVERT, the Tokyo VAAC reported that on 4 June an ash plume rose to an altitude of 2.7 km (9,000 ft) a.s.l. and drifted SE. KVERT reported that during 20-27 May seismicity from Kizimen was above background levels. Strong tremor was detected on 12 May; tremor amplitude gradually increased from 18 May to 24 May. Satellite images showed a large bright thermal anomaly daily on the volcano during 21-24 and 26 May. The Aviation Color Code remained at Orange. KVERT reported that during 13-20 May seismicity from Kizimen was above background levels, and indicated that possible ash plumes rose to an altitude of 5.9 km (19,400 ft) a.s.l. and 4.9 km (16,100 ft) a.s.l. on 14 and 17 May, respectively. Satellite images showed a large bright thermal anomaly daily on the volcano and ash plumes that drifted 24 km S and SE during 14-15 May. The Aviation Color Code remained at Orange. KVERT reported that on 5 and 11 May seismicity from Kizimen was high; seismic data was not collected the other days during 6-13 May because of technical problems. Satellite images showed a large bright thermal anomaly daily on the volcano. During 6-7 May, ash plumes drifted 45 km SE and gas-and-steam plumes drifted 59 km N. Ashfall formed a layer as thick as 1 mm in Milkovo village, 120 km SW, on 10 May. A The Aviation Color Code remained at Orange. Following strong explosions at Kizimen on 3 May, KVERT reported that ash fell in Kipelye Springs, 15 km W, and accumulated to a thickness of about 1 cm. A large and hot pyroclastic flow deposit on the NE flank was detected in satellite imagery the next day. Analysis of the satellite images also revealed ash plumes that drifted 280 km S during 3-5 May and 62 km in various directions on 6 May. A daily thermal anomaly was also noted. The Aviation Color Code remained at Orange. Based on analyses of satellite imagery, KVERT reported that during 22-29 April a large bright thermal anomaly was detected over Kizimen daily and ash plumes drifted 135 km in multiple directions. Ground-based observations indicated that gas-and-steam plumes with a small amount of ash rose to an altitude of 3.5 km (11,500 ft) a.s.l. and drifted W during 20-21 April. The Aviation Color Code remained at Orange. On 3 May seismic data indicated a possible series of ash plumes and avalanches. An ash plume may have risen to an altitude of 10 km (33,000 ft) a.s.l. The Aviation Color Code was raised to Red. On 4 May seismicity decreased but remained high. Satellite imagery showed ash plumes at altitudes of 4-6 km (13,100-19,700 ft) a.s.l. The Aviation Color Code was lowered to Orange. KVERT reported that during 15-22 April seismicity from Kizimen was high, with many shallow volcanic earthquakes and volcanic tremor continuing to be detected. Satellite images showed a large bright thermal anomaly daily on the volcano. Ash plumes drifted in multiple directions as far as 254 km during 14-18 and 21 April. The Aviation Color Code remained at Orange. KVERT reported that during 8-15 April seismicity from Kizimen was high, with many shallow volcanic earthquakes and volcanic tremor continuing to be detected. Satellite images showed a large bright thermal anomaly daily on the volcano. Ash plumes drifted SE as far as 255 km during 7-11 April. The Aviation Color Code remained at Orange. Based on analyses of satellite imagery, the Tokyo VAAC reported that a possible eruption on 16 April produced a plume that rose to an altitude of 2.4 km (8,000 ft) a.s.l. and drifted NW. Subsequent images that day showed continuing ash emissions. KVERT reported that during 1-7 April seismicity from Kizimen was high, with many shallow volcanic earthquakes and volcanic tremor continuing to be detected. Satellite images showed a large bright thermal anomaly daily on the volcano. Ash and gas-and-steam plumes drifted multiple directions as far as 259 km. The Aviation Color Code remained at Orange. Based on analyses of satellite imagery, the Tokyo VAAC reported that a possible eruption on 7 April produced a plume that rose to an altitude of 3.7 km (12,000 ft) a.s.l. and drifted S. Subsequent images that day and on 8 April showed continuing ash emissions. Another possible eruption on 10 April produced a plume that rose to an altitude of 4.3 km (14,000 ft) a.s.l. and drifted SE. KVERT reported that during 25 March-1 April seismicity from Kizimen was high, with many shallow volcanic earthquakes and volcanic tremor continuing to be detected. Satellite images showed a large bright thermal anomaly daily on the volcano. Ash and gas-and-steam plumes drifted multiple directions as far as 464 km. The Aviation Color Code remained at Orange. Based on analyses of satellite imagery, the Tokyo VAAC reported that a possible eruption on 1 April produced a plume that rose to an altitude of 4.3 km (14,000 ft) a.s.l. and drifted E. Subsequent images that day and during 2-3 April showed continuing ash emissions. Another possible eruption on 6 April produced a plume that rose to an altitude of 3.7 km (12,000 ft) a.s.l. KVERT reported that during 18-25 March seismicity from Kizimen was high, with many shallow volcanic earthquakes and volcanic tremor continuing to be detected. Satellite images showed a large bright thermal anomaly daily on the volcano. Ash and gas-and-steam plumes drifted 313 km N and E during 17 and 19-24 March. The Aviation Color Code remained at Orange. Based on analyses of satellite imagery, the Tokyo VAAC reported that during 25-29 March ash was detected in satellite imagery. KVERT reported that during 11-18 March seismicity from Kizimen was high, with many shallow volcanic earthquakes and volcanic tremor continuing to be detected. Satellite images showed a large bright thermal anomaly daily on the volcano. Ash plumes drifted as far as 219 km SE and W on 11, 14, and 16 March. KVERT noted that the Aviation Color Code remained at Orange. Based on information from KEMSD, the Tokyo VAAC reported that during 20-22 March eruptions produced plumes that rose to altitudes of 6.1-7 km (20,000-23,000 ft) a.s.l. Some plumes drifted NW. KVERT reported that during 4-11 March seismicity from Kizimen was high with many shallow volcanic earthquakes and volcanic tremor continued to be detected. Satellite images showed a large bright thermal anomaly daily over the volcano. Ash plumes drifted 142 km NW on 5 March. KVERT noted that the Aviation Color Code remained at Orange. Based on information from KEMSD and KVERT, the Tokyo VAAC reported that during 12-13 and 15 March eruptions produced plumes that rose to altitudes of 5.5-7.6 km (18,000-25,000 ft) a.s.l. KVERT reported that during 25 February-4 March seismicity from Kizimen was high but variable, and many shallow volcanic earthquakes as well as volcanic tremor continued to be detected. Satellite images showed a bright thermal anomaly over the volcano daily. Ash plumes drifted 180 km N on 25 and 28 February, and 2 March. The Aviation Color Code remained at Orange. Based on information from KEMSD and analyses of satellite imagery, the Tokyo VAAC reported that on 5 March eruptions produced plumes that rose to altitudes of 6.1-6.4 km (20,000-21,000 ft) a.s.l. KVERT reported that during 18-21 February seismicity from Kizimen was high but variable, and many shallow volcanic earthquakes as well as volcanic tremor continued to be detected. Satellite images showed a bright thermal anomaly over the volcano daily during 18-25 February. Ash plumes drifted more than 200 km E during 21-24 February. The Aviation Color Code remained at Orange. The Tokyo VAAC reported that on 25 February an eruption detected in satellite imagery produced a plume that rose to an altitude of 3 km (10,000 ft) a.s.l. and drifted E. Subsequent notices stated that continuing ash emissions dissipated later that day. NASA's Earth Observatory posted a satellite image acquired on 25 February that showed steam and ash plumes drifting NE. Ash on the snow was visible NE, E, and SE of the volcano. The VAAC also noted that eruptions reported by KEMSD during 27 February-1 March produced plumes that rose to altitudes of 6.1-7.3 km (20,000-24,000 ft) a.s.l. KVERT reported that during 11-18 February seismicity from Kizimen was high but variable, and many shallow volcanic earthquakes as well as volcanic tremor continued to be detected. Satellite images showed a bright thermal anomaly over the volcano daily. During 12-17 February ash plumes drifted more than 170 km E. The Aviation Color Code remained at Orange. The Tokyo VAAC reported that on 22 February a possible eruption detected in satellite imagery produced a plume that rose to an altitude of 2.7 km (9,000 ft) a.s.l. and drifted E. Subsequent notices stated that ash emissions had continued then dissipated later that day. KVERT reported that during 4-11 February seismicity from Kizimen was high but variable, and many shallow volcanic earthquakes as well as volcanic tremor continued to be detected. Ash plumes drifted more than 260 km E. Satellite images during 4-14 February showed a bright daily thermal anomaly over the volcano. On 14 February the magnitude of volcanic tremor gradually increased and resembled seismic patterns noted on 8 December, a few days before strong ash explosions occurred. The Aviation Color Code remained at Orange. KVERT reported that during 28 January-4 February seismicity from Kizimen was high but variable, and many shallow volcanic earthquakes as well as volcanic tremor continued to be detected. Satellite images showed a bright thermal anomaly over the volcano daily. During 27-31 January and 1-3 February ash plumes rose to an altitude of 6.1 km (16,400 ft) a.s.l. and drifted more than 430 km E. The Aviation Color Code remained at Orange. Based on information from KEMSD, the Tokyo VAAC reported that on 8 February an eruption produced a plume that rose to an altitude of 4 km (13,000 ft) a.s.l. KVERT reported that during 21-28 January seismicity from Kizimen was high but variable, and many shallow volcanic earthquakes as well as volcanic tremor continued to be detected. Seismic data analyses suggested that ash plumes possibly rose to an altitude greater than 10 km (32,800 ft) a.s.l. on 23 and 25 January, and not more than 6 km (19,700 ft) a.s.l. on the other days. Satellite images showed a bright thermal anomaly over the volcano daily, and ash plumes that drifted more than 325 km W, S, and E. The Aviation Color Code remained at Orange. Based on analyses of satellite imagery, the Tokyo VAAC reported that a possible eruption on 29 January produced a plume that rose to an altitude of 3.7 km (12,000 ft) a.s.l. and drifted SW. Subsequent images that day and during 30 January-1 February showed continuing ash emissions. KVERT reported that during 14-21 January seismicity from Kizimen was high but variable, and many shallow volcanic earthquakes as well as volcanic tremor continued to be detected. Seismic data analyses suggested that ash plumes possibly rose to an altitude no higher than 6 km (19,700 ft) a.s.l. Satellite images showed a daily bright thermal anomaly over the volcano, and ash plumes that drifted more than 200 km W during 15-16 and 20 January. The Aviation Color Code remained at Orange. Based on analyses of satellite imagery and reports from KVERT, the Tokyo VAAC reported that during 23-25 January eruptions produced plumes that rose to altitudes of 4.9-10.1 km (16,000-33,000 ft) a.s.l. KVERT reported that during 7-13 January a thermal anomaly over Kizimen was observed in satellite imagery. Pyroclastic flow deposits on the E flank were noted. Seismicity, recorded during 6-7 and 12 January, was high but variable, and many shallow volcanic earthquakes as well as volcanic tremor continued to be detected. Ash plumes that rose to altitudes of 6-8 km (20,000-26,000 ft) a.s.l. during 5-13 January were visually observed drifting multiple directions, and seen in satellite imagery more than 275 km W and NW. On 12 January ashfall was reported in the villages of Anavgai and Esso, 140 km NW. Seismic data during 14-15 January suggested that ash plumes rose to altitudes of 4-5 km (13,100-16,400 ft) a.s.l. Satellite images showed a bright thermal anomaly over the volcano and ash plumes drifting more than 180 km W on 15 January. The Aviation Color Code level was lowered to Orange. KVERT reported that ash emissions from Kizimen had been essentially continuous during 31 December-7 January, producing ash plumes mostly below altitudes of 6-8 km (20,000-26,000 ft) a.s.l. reported by pilots or observed in satellite imagery. Seismicity remained high but variable and volcanic tremor continued to be recorded. A thermal anomaly over the volcano was observed in satellite imagery. On 5 January ash plumes drifted more than 500 km ENE. Ashfall was reported on the Komandorsky Islands, 350-500 km E. The Tokyo VAAC reported that ash continued to be observed in satellite imagery on 5 Janaury. According to information from KVERT and analyses of satellite imagery, a possible eruption on 6 January produced a plume that rose to an altitude of 3.7 km (12,000 ft) a.s.l. and drifted E. Subsequent satellite images that same day showed continuing ash emissions. Ash plumes drifted NW on 9 January, and drifted NW again on 11 January, at an altitude of 2.7 km (9,000 ft) a.s.l. The Color Code remained at Red. KVERT reported that a thermal anomaly over Kizimen's lava dome was observed in satellite imagery during 29 December-1 January and that an explosive eruption that began on 13 December continued. On 31 December seismicity increased and volcanic tremor was detected. Explosions occurred sporadically for a period of about 20 minutes. Ash plumes detected in satellite imagery rose to an altitude of 8 km (26,200 ft) a.s.l. and drifted SW. Ashfall at least 1 mm thick occurred in multiple areas 225-275 km SSW, including Petropavlovsk-Kamchatsky, Yelizovo, Paratunka, and Nalychevo. On 1 January the Aviation Color Code was raised to Red. Ash plumes at an altitude of 4 km (13,100 ft) a.s.l. drifted 480-500 km SW; ash continued to accumulate in some areas. Seismic data indicated increased activity on 3 January. Explosions continued, and ash plumes drifted more than 200 km SE. A large and bright thermal anomaly was observed in satellite imagery. Based on analysis of satellite imagery, the Tokyo VAAC reported that possible eruptions during 2-4 January produced plumes that rose to an altitude of 3-4.6 km (10,000-15,000 ft) a.s.l. and drifted S, E, and NE. Subsequent images on those same days showed ash emissions continuing, then dissipating. KVERT reported that during 17-24 December seismic activity at Kizimen was above background levels, and a thermal anomaly over the lava dome was detected in satellite imagery. The number of shallow seismic earthquakes increased from 110 events on 17 December to 304 events on 22 December. Volcanic tremor was detected on 23 December. The Aviation Color Code remained at Orange. During 26-28 December seismicity increased and there were possible small ash explosions and hot avalanches. A thermal anomaly over the lava dome was seen in satellite imagery. The Aviation Color Code was raised to Red. On 27 December seismic analysis indicated that ash plumes possibly rose to altitudes of 3.5-4.5 km (11,500-14,800 ft) a.s.l. Satellite imagery showed ash plumes drifting 140 km W at an altitude of 4 km (13,100 ft) a.s.l. On 28 December, based on a Yelizovo Airport (UHPP) notice, the Tokyo VAAC reported an ash plume drifting W at an altitude of 3.7 km (12,000 ft) a.s.l. KVERT reported that seismicity at Kizimen decreased following the eruption on 13 December. Kronotsky National Park staff, residing at Ipuin about 16 km WSW, noted that the water level in Levaya Schapina river rose 60 cm after the explosions and remained elevated for the next two days. The water was also very muddy. During 14-17 December earthquake activity was above background levels and a thermal anomaly over the lava dome was detected in satellite imagery. The Aviation Color Code remained at Orange. KVERT reported that during 3-8 December seismicity at Kizimen was above background levels. An increase in seismicity reported on 9 December was possibly caused by snow avalanches. That same day, the Tokyo VAAC reported that according to KEMSD an eruption produced a plume that rose to an altitude of 2.7 km (9,000 ft) a.s.l. and drifted N. Ash was not identified in satellite images. The Level of Aviation Color Code remained at Yellow. On 9 December, seismicity significantly increased and the Aviation Color Code level was raised to Orange. A bright thermal anomaly was observed in satellite imagery the next day. On 13 December an explosive eruption generated ash plumes that rose to altitudes of 3-3.5 km (9,800-11,500 ft) a.s.l. and drifted NW. Based on information from KEMSD and analysis of satellite imagery, the Tokyo VAAC reported that an ash plume rose to an altitude of 10 km (33,000 ft) a.s.l. and drifted N. KVERT noted that lightning in the ash plumes was observed. The Aviation Color Code was raised to Red. Ash deposits in Kozyrevsk and Tigil, 110 and 308 km NW, respectively, were 5 mm thick. Later that day seismic activity decreased; the Aviation Color Code was lowered to Orange. KVERT reported that volcanologists flying around Kizimen by helicopter on 20 November observed several new fumaroles at the summit and SW flank. A small amount of "dust" covered the SW flank, possibly from the new fumaroles. Seismic activity was above background levels during 19-26 November. The Level of Aviation Color Code was raised to Yellow. Based on information from the Yelizovo Airport (UHPP), the Tokyo VAAC reported that on 17 November an ash plume from Kizimen rose to an altitude of 3 km (10,000 ft) a.s.l. and drifted NE. According to staff at a tourist center 10 km from Kizimen, KVERT reported strong gas-and-steam activity on 11 November resulted in a plume, possible containing some ash, that rose to an altitude of 4 km (13,100 ft) a.s.l. Seismic activity continued to be detected during 5-12 November. The Level of Aviation Color Code remained at Green. KVERT reported that seismicity from Kizimen was slightly above background levels on 6, 8, and 10 November and at background levels the other days during 7-13 November. The Level of Aviation Color Code was lowered to Green. KVERT reported that seismicity from Kizimen was above background levels during 8-11 October and at background levels during 12-16 October. A weak thermal anomaly was seen at the volcano in satellite imagery on 9 October. The Level of Aviation Color Code remained at Yellow. On 10 October, KVERT reported that seismicity from Kizimen was at background levels in September, but began to increase in October, especially on the 9th. A weak thermal anomaly was seen over the volcano in satellite imagery on 17 and 21 September. The Level of Aviation Color Code was raised to Yellow. KVERT reported that seismic activity at Kizimen had decreased to background levels on 23 August and remained there through 31 August. Volcanologists observed gas-and-steam plumes rising from the summit, activity described as normal. The Level of Concern Color Code was lowered to Green on 31 August. On 31 July, KVERT reported that seismic activity from Kizimen had increased since 11 July. Several tens of shallow earthquakes per day were detected. The Level of Concern Color Code was raised to Yellow. According to a news report, on 1 March four M 1.75-3.75 earthquakes were recorded at Kizimen by the Kamchatkan Experimental Methodical Seismological Department. KVERT scientists believe these earthquakes were probably tectonic. No signs of increased volcanic activity were visible on satellite imagery. Earthquakes at Kizimen appeared in July 2009 and increased substantially in the middle of that month (figures 1 and 2). During 11 July 2009 to 6 April 2010 instruments recorded 1,940 earthquakes. The largest number of seismic events took place during July and reached up to 120 a day. On 20 August instruments also recorded weak, faltering, and spasmodic volcanic tremor. Witnesses near the volcano felt shaking from many earthquakes, sometimes accompanied by an underground rumble. Figure 1. Sketch map showing location of Kizimen on the Kamchatkan Peninsula. Figure 2. A plot of seismic events at Kizimen during July 2009 to April 2010. A new station was installed around the beginning of 2010, accounting for the increased number of recorded events then. Plotted data taken from online reporting by the Kamchatka Branch of the Geophysical Service of the Russian Academy of Sciences (KB GS RAS). In August 2009 scientists from Institute of Volcanology and Seismology researched the fumarolic field on the NW slope (figures 3 and 4). The temperature on the NW part of the field had risen from 181°C to 235°C. On the SW part of the volcano it changed from 171°C to 340°C. On the central part it was 340°C. Figure 3. Fumarolic gases escaping at Kizimen, August 2009. Scientists are sampling the gases and condensate (left center). Photo by Alexandr Ovsyannikov. Figure 4. View from the NE looking at Kizimen with a cloud-covered summit and patches of snow. Photo by Igor Tembrel (Tembrel and Ovsyannikov, 2009). The volcano sits in an area that is structurally complex, the scene of intense tectonism and extensive modern deformation. According to Melekestsev and others (1995), Kizimen is "located on the SE flank of the Shchapinsky graben and is confined to a system of large amplitude NE-striking faults that includes the junction of the graben with the horst of the Tumrok ridge." Melekestsev, I., Ponomareva, V., and Volynets, O., 1995, Kizimen volcano (Kamchatka)?a future Mount St. Helens? : Journal of Volcanology and Geothermal Research, v. 65, p. 205-226. Information Contacts: Kamchatka Volcanic Eruptions Response Team (KVERT), Institute of Volcanology and Seismology (IV&S) Far East Division, Russian Academy of Sciences (FED RAS); Kamchatka Branch of the Geophysical Service of the Russian Academy of Sciences (KB GS RAS), Piip Ave. 9, Petropavlovsk-Kamchatsky, 683006, Russia (URL: http://www.kscnet.ru/ivs, http://www.emsd.ru/~ssl/monitoring/main.htm); Alexandr Ovsyannikov and Igor Tembrel, IV&S FED RAS. Eruption began here during mid-November 2010, the first since 1927-1928 (Brown and other, 2010). Ash plumes rose to ~10 km and were visible in satellite imagery as they traveled hundreds of kilometers during November 2010 through at least late February 2011. Our previous Bulletin (BGVN 35:02) reported that the number of earthquakes at Kizimen had increased substantially beginning in July 2009 (up to 120 earthquakes per day) through early April 2010 and that fumarolic temperatures increased in August. This report discusses activity since early April 2010. After early April 2010, seismicity at Kizimen entered a quiescent phase until the Kamchatkan Volcanic Eruption Response Team (KVERT) reported increased seismic activity on 20 August and particularly during early November 2010. Based on information from a tourist center 10 km from Kizimen, KVERT noted that on 11 November 2010, strong gas-and-steam emissions resulted in a plume, possibly containing some ash, that rose to an altitude of 4 km. According to the Kamchatkan Branch of Geophysical Survey (KG GS RAS), seismicity of the volcano was above background levels all week, and an M 4 earthquake occurred on 16 November 2010. Accroding to information from the Yelizovo Airport (UHPP), the Tokyo VAAC reported that on 17 November an ash plume from Kizimen rose to an altitude of 3 km and drifted NE. KVERT noted the lack of satellite data about ash near Kizimen. The Level of Aviation Color Code remained at Green (on a scale that goes from low to high using these terms: Green, Yellow, Orange, and Red). On 17 November 2010 (UTC), based on information from KB GS RAS and analysis of satellite imagery, the Tokyo VAAC reported that an ash plume rose to an altitude of 3 km and drifted NE. KVERT noted lightning in the ash plumes. The Aviation Color Code was raised to Red. Seismic activity was above background levels during 19 November to 24 December 2010. On 20 November, volcanologists flying around Kizimen by helicopter observed several new fumaroles at the summit and SW flank. A small amount of "dust" covered the SW flank, possibly ash from the new fumaroles. Activity at the established old fumarole "Revuschaya" on the volcano's NE flank decreased. No thermal anomaly was noted from satellite images. The Level of Aviation Color Code was raised to Yellow. On 9 December 2010, seismicity increased significantly and the Aviation Color Code level was raised to Orange. That same day, the Tokyo VAAC reported that, according to KB GS RAS, an explosion produced a plume that rose to an altitude of 2.7 km and drifted N. Ash was not identified in satellite images. A bright thermal anomaly was observed in satellite imagery the next day. The beginning of the eruption Kizimen was captured in in a photo made by Don Page on 10 December from a commercial flight. The eruption start from long fissure on the SE slope (figure 5). Figure 5. Photo taken on 10 December 2010 at 0314 UTC (1414 local Kamchatka time; from Seat 36K of Air Canada Flight 063 from Vancouver, Canada, to Incheon-Seoul, Korea). A dark, angled (non-vertical) plume rises from the along the length of an elongate fissure network on the SE slope. [Photo: 981x656 pixels, with a Nikon D80 digital camera and an AF-S Nikkor 18-200 mm zoom lens (probably set at 200 mm).] Photo by Don Nelson Page (University of Alberta). Evgeny Gordeev wrote a reply to Don Page thanking him for sharing the rare photos (figure 5) of the eruption's start and providing interpretation of the unusual genesis of the ash cloud. Gordeev told Page that he had documented the beginning of the Kizimen 10 December eruption, noting that the closest village to Kizimen is almost 100 km distant. Gordeev commented that the only practical way to monitor the volcano involves satellite images, which are discontinuous and not always of high resolution. "Your pictures help us enormously, mainly to recognize the vent of eruption. It is very unusual for volcanoes to erupt through [such a] long fissure on the slope. You are right, this fissure [is] very narrow and very long. After [this,] your pictures you will be very [well] known [by] volcanologists." On 12 December 2010 an explosive eruption generated ash plumes that rose to an altitude of 3-3.5 km and drifted NW. Ash deposits in Kozyrevsk and Tigil, 110 and 308 km NW, respectively, were 5 mm thick. Later that day seismic activity decreased and the Aviation Color Code was lowered to Orange. Kronotsky National Park staff, residing at Ipuin (~16 km WSW), noted that the water level in Levaya Schapina river rose 60 cm after the explosions and remained elevated for the next two days. The water was also very muddy. During 14-24 December seismicity remained above background and a thermal anomaly over the lava dome was detected in satellite imagery. KVERT noted that during 17-24 December 2010 the number of shallow seismic earthquakes increased from 110 events on 17 December to 304 events on 22 December. Volcanic tremor was detected on 23 December. During 26-28 December, seismicity also increased and there were possible small ash explosions and hot avalanches. A thermal anomaly over the lava dome was again seen in satellite imagery. On 27 December seismic analysis indicated that ash plumes that day possibly rose to altitudes of 3.5-4.5 km. Satellite imagery showed ash plumes drifting 140 km W at an altitude of 4 km. On 28 December, based on a Yelizovo Airport (UHPP) notice, the Tokyo VAAC reported an ash plume drifting W at an altitude of 3.7 km. The Aviation Color Code was raised to Red. A thermal anomaly over Kizimen's lava dome was again observed in satellite imagery during 29 December 2010-1 January 2011 and an explosive eruption that began on 13 December continued. On 31 December seismicity increased and volcanic tremor was detected. Explosions occurred sporadically for a period of about 20 minutes. Ash plumes detected in satellite imagery rose to an altitude of 8 km and drifted SW. Ashfall at least 1 mm thick occurred in multiple areas 225-275 km SSW, including Petropavlovsk-Kamchatsky, Yelizovo, Paratunka, and Nalychevo. Ash plumes at an altitude of 4 km drifted 480-500 km SW; ash continued to accumulate in some areas. Seismic data indicated increased activity on 3 January. Based on analysis of satellite imagery, the Tokyo VAAC reported that possible eruptions during 2-4 January produced plumes that rose to an altitude of 3-4.6 km and drifted S, E, and NE. Subsequent images on those same days showed ash emissions continuing, then dissipating. During 4-7 January seismicity remained high and variable and volcanic tremor continued. A thermal anomaly over the volcano was observed in satellite imagery. Explosions continued through 7 January 2011 producing ash plumes mostly below altitudes of 6-8 km as reported by pilots or observed in satellite imagery. These drifted more than 200 km SE. A large and bright thermal anomaly was observed in satellite imagery. A pattern of high seismicity and ash emissions was noted during early January 2011. On 5 January ash plumes drifted more than 500 km ENE. Ashfall was reported on the Komandorsky Islands, 350-500 km E (figure 6). Figure 6. An ash plume rising from Kizimen and blowing to the ENE on 5 January 2011. Courtesy of A. Lobashevsky. The Tokyo VAAC reported that ash continued to be observed in satellite imagery on 5 January. According to information from KVERT and analyses of satellite imagery, a possible eruption on 6 January produced a plume that rose to an altitude of 3.7 km and drifted E. Subsequent satellite images that same day showed continuing ash emissions. Ash plumes drifted NW on 9 January, and drifted NW again on 11 January 2011, at an altitude of 2.7 km. KVERT reported that during 7-13 January 2011 they saw both a thermal anomaly over Kizimen in satellite imagery and pyroclastic flow deposits on the E flank. Seismicity recorded during 6-7 and 12 January was high but variable, and many shallow volcanic earthquakes as well as volcanic tremor continued to be detected. Ash plumes that rose to altitudes of 6-8 km during 5-13 January were seen drifting multiple directions, and appeared in satellite imagery to be drifting more than 275 km W and NW. On 12 January ashfall was reported in the villages of Anavgai and Esso, 140 km NW. Seismic data during 14-15 January suggested that ash plumes rose to altitudes of 4-5 km. Satellite images showed a bright thermal anomaly over the volcano and ash plumes drifting more than 180 km W on 15 January 2011. The Aviation Color Code level was lowered to Orange. From 14 January through 1 February, KVERT reported that seismicity from Kizimen was high but variable, and many shallow volcanic earthquakes as well as volcanic tremor continued to be detected. Seismic data analyses suggested that ash plumes possibly rose to an altitude no higher than 6 km. Satellite images showed a daily bright thermal anomaly over the volcano, and ash plumes that drifted more than 200 km W during 15-16 and 20 January. Based on satellite data, the Tokyo VAAC also reported that during 23-25 January eruptions produced plumes that rose to altitudes of 4.9-10.1 km. Based on analyses of satellite imagery, the Tokyo VAAC reported that a possible eruption on 29 January produced a plume that rose to an altitude of 3.7 km and drifted SW. Photo and satellite images taken during late January through late February showed continuing ash emissions (figures 7 and 8). Figure 7. Two images of Kizimen taken on 26 January 2011. On the left photo (a), a dark pyroclastic flow rushes down the slopes of the volcano. Photo by Igor Shpilenok. On the right (b), a thermal infra-red (IR) image taken of a pyroclastic flow during an explosion (IR scale temperature appears at right). The pyroclastic flow originated from the summit of the lava dome and swept downward. (The infrared image shows radiated energy as areas of bright glow.) During this eruptive stage a pyroclastic surge spread out over the slopes. IR image by V. Droznin, S. Chirkov, and I. Dubrovskaya (IVS RAS). Figure 8. This satellite image taken on 25 February 2011 shows a vigorous ash-laden plume extending from Kizimen at an altitude of ~3 km, drifting towards the NE, and visible for more than 170 km. The white portion of the plume is likely rich in steam, while the tan plume is primarily ash. The ground E of Kizimen is coated in newly fallen ash not yet covered by fresh snow. To the S of the summit are several dark streaks. These are probably traces of pyroclastic flows. Thermal anomalies (red in colored versions of this Bulletin) show the presence of recent hot block-and-ash flows from summit dome collapses. The image was acquired by the Advanced Spaceborne Thermal Emission and Reflection Radiometer (ASTER) aboard the Terra satellite. Courtesy of NASA/GSFC/METI/ERSDAC/JAROS. Reference: Browne B., Izbekov, P., Eichelberger, J., and Churikova, T., 2010, Pre-eruptive storage conditions of the Holocene dacite erupted from Kizimen Volcano, Kamchatka: International Geology Review, v. 52, Issue 1 January 2010, p. 95-110. Information Contacts: Kamchatka Volcanic Eruptions Response Team (KVERT), Institute of Volcanology and Seismology Russian Academy of Sciences, Far East Division, 9 Piip Blvd., Petropavlovsk-Kamchatsky, 683006, Russia (URL: http://www.kscnet.ru/ivs/); Kamchatka Branch of the Geophysical Service of the Russian Academy of Sciences (KB GS RAS), Piip Ave. 9, Petropavlovsk-Kamchatsky, 683006, Russia (URL: http://www.kscnet.ru/ivs/); Sergey Senukov, Russia (URL: http://www.emsd.ru/) Valery Droznin and Sergey Chirkov, Institute of Volcanology and Seismology Russian Academy of Sciences, Far Eastern Branch, 9 Piip Boulevard, Petropavlovsk-Kamchatsky, 683006, Russia; A. Lobashevsky (URL: http://www.photokamchatka.ru/); I. Shpilenok (URL: http://shpilenok.livejournal.com/44922.html); NASA Earth Observatory (URL: http://earthobservatory.nasa.gov/); Don Nelson Page, Theoretical Physics Institute, 412 Physics Lab., University of Alberta, Edmonton, Alberta T6G 2J1, Canada. This report covers behavior at Kizimen (figure 9) during February-September 2011, an interval where the volcano emitted substantial ash plumes (often blowing towards major air traffic routes, in four cases with plumes 300-475 km long). Viscous block lava flows extended over 2 km from the vent. The progression of this eruption can be divided into three stages: increased seismicity, which began 1.5 years before the eruption (BGVN 35:02); gas-and-steam emissions starting on 11 November 2010, and the eruption, which began on 9 December 2010 (BGVN 36:01). The eruption continued through at least September 2011. Figure 9. (upper left) Regional location of Kizimen on Kamchatka Peninsula, Russia; red square indicates area of enlarged map. (lower right) Local setting of Kizimen among neighboring volcanoes. Regional map was found on the internet, authorship unknown. Local map was provided by Droznin Valery (Institute of Volcanology and Seismology, Russian Academy of Sciences, Far Eastern Branch). During February to September 2011, scientists continued to observe seismicity that consisted of a large number of weak, local surface earthquakes (sometimes accompanied by significant seismic noise) and weak volcanic tremor. The Kamchatka Branch of the Geophysical Service of the Russian Academy of Sciences (KB GS RAS) reported a substantial increase in the number of recorded earthquakes during August-September 2011 (figure 10a). KB GS RAS observers also noted a nearly continuous thermal anomaly (figure 10b) coupled with volcanic activity consisting of both pyroclastic flows and a steady stream of gas-and-ash plumes that drifted 20 to 475 km from the volcano (table 1). Figure 10. For Kizimen, a) the number of earthquakes per day and b) number of thermal anomaly pixels per day during February-September 2011. Data from Kamchatka Branch of the Geophysical Service of the Russian Academy of Sciences (KB GS RAS). Table 1. Summary of selected significant volcanic ash plumes during February-August 2011. This table records four days with plume lengths of greater than 300 km. One plume, on 2 April, extended 475 km SE. Data from KB GS RAS. A rose diagram created from the data in table 1 showed that plumes predominantly drifted SE (13 cases, figure 11). The longest plume (475 km on 2 April) also extended to the SE. Figure 11. A rose diagram created from table 1; each point plotted represents the direction and distance traveled by an individual Kizimen plume. Based on data from KB GS RAS. Ash dispersal from Kizimen has strong implications for aviation, as the routes of major aircraft lie to the E of the volcano and many of the plumes traveled in directions between NE and SE. Many plumes, most notably the farthest reaching plumes, drifted SE. Eastward components (between SE and NE) make up 25 cases, over half of the 40 total cases shown in table 1. Several events occurred during April: explosive emissions ejected ash and rock, and effusive lava flows on the upper flanks originated from summit crater vents. On 16 April, lava flows appear to have melted snow, and meltwater drained into Lake Kronotskoe. On 26 July, lava on E slope flowed 1 km from a summit vent. September 2011 fieldwork. During fieldwork to Kizimen in September 2011, volcanologists observed lava flow and pyroclastic-flow deposits (figure 12). According to Natalia Malik (2011), on 14 September 2011, the volcano erupted constantly, and earthquakes were felt. The lava flow front on the E slope reached 1,300 m elevation, extending ~ 2.3 km from the vent area. The thickness of the flow, based on a visual estimate, was ~ 50 m. The bottom of the flow produced hot avalanches that were incandescent at night. Figure 12. a) View of Kizimen's N side from a helicopter with a fresh lava flow (dark area at left) descending the E slope. Note the thick steam plume from the summit. b) Fresh lava flow front on the E flank; person at left for scale. c) Pyroclastic-flow deposit in Poperechny Creek, on the NE side of the volcano; for scale, the dog is ~0.5 m tall. Photos taken by Natalia Malik in September 2011. In the valley of Poperechny Creek on the NE flank of the volcano, observers documented fresh, hot pyroclastic-flow deposits, which locally emitted steam and other gases (figure 12c). Surface water caused erosion of the pyroclastic flow deposit's surface (figure 12c). The thickness of the pyroclastic-flow deposits was estimated to be on the order of 3 m. During emplacement of the pyroclastic flows, trees and vegetation on the valley's lower slopes suffered extensive damage. Several satellite images also helped to depict Kizimen's recent activity (figure 13). Notice the striking differences between the images from 6 September 2009 and 5 September 2011. Figure 13. a) Kizimen false-color satellite image acquired on 6 September 2009, showing the pre-eruptive state of the volcano. b) False-color satellite image acquired on 5 September 2011, showing the enormous change over large areas of the volcano, particularly on the E side. A prominent lava flow is present on the E flank. Freshly erupted material, such as tephra and lahars, blocked drainages, and formed a new lake. Freshly erupted material appears brown and vegetation appears red. These images were acquired by the Advanced Spaceborne Thermal Emission and Reflection Radiometer (ASTER) aboard the Terra satellite. Courtesy of NASA Earth Observatory. According to NASA Earth Observatory, the new volcanic deposits (appearing brown in figure 13b) have covered much of the vegetation (red) on the slopes of the volcano, especially to the E. Likewise, volcanic material has filled rivers and streams around the volcano. The same photograph shows a modest volcanic plume rising from Kizimen's summit, accompanied by a smaller plume from a fumarole to the NW. These images illustrate the growth of a stratovolcano: lava flows interbedded with layers of volcanic ash, cinders, blocks, and bombs. The lava flow on Kizimen is a viscous block lava (that forms the steep-sided flows seen in figure 12b). As the flow slowly advanced down the E side of the volcano, the surface collapsed, sending boulders, ash, and other material into the valley below. Reference: Malik, Natalia, 2011, Current activity of Kizimen, September 2011 (in Russian): Institute of Volcanology and Seismology, Russian Academy of Sciences (http://www.kscnet.ru/ivs/volcanoes/inform_messages/2011/Kizimen_092011/Kizimen_092011.html). Information Contacts: Kamchatka Branch of the Geophysical Service of the Russian Academy of Sciences (KB GS RAS), Piip Ave. 9, Petropavlovsk-Kamchatsky, 683006, Russia; Kamchatka Volcanic Eruptions Response Team (KVERT), Institute of Volcanology and Seismology, Russian Academy of Sciences, Far East Division, 9 Piip Blvd., Petropavlovsk-Kamchatsky 683006, Russia (URL: http://www.kscnet.ru/ivs/); Sergey Senukov, Kamchatka Branch of the Geophysical Service, Russian Academy of Sciences (KB GS RAS), (URL: http://www.emsd.ru/); Valery Droznin and Natalia Malik, Institute of Volcanology and Seismology Russian Academy of Sciences, Far Eastern Branch, 9 Piip Blvd., Petropavlovsk-Kamchatsky 683006, Russia; NASA Earth Observatory (URL: http://earthobservatory.nasa.gov/). Significant eruptions began at Kizimen in December 2010 (BGVN 36:10) and continued through May 2013. Our previous report highlighted frequent ash explosions, the development of a ˜2.3 km lava flow, and elevated seismicity through September 2011. In this report we continue to present data based on the monitoring efforts of the Kamchatka Branch of the Geophysical Service of the Russian Academy of Sciences (KB GS RAS) and the Kamchatka Volcanic Eruptions Response Team (KVERT). Developments in data analysis based on Kizimen's 2010 eruption. The onset of activity in late 2010 provided opportunities for new methods of data analysis. Ji and others (2013) and Senyukov (2013) highlighted distinctive precursory activity that could successfully forecast volcanic behavior. Both investigative groups also mentioned the challenge of limited datasets for a volcanic system that recently became active without past records of geophysical data (in particular, deformation or seismic data during a time of elevated activity). The last eruption from Kizimen occurred during 1927-1928 (Siebert and others, 2010), before satellite or seismic monitoring (instrumentation was available in 1961) had begun. The remote sensing investigation by Ji and others (2013) concluded that InSAR datasets from 2008 and 2010 measured > 6 cm of progressive surface displacement in the satellite's line-of-sight before the eruption began. While "InSAR has been demonstrated to be an important tool for investigating volcanic deformation and understanding magma supply dynamics at many of the world's volcanoes," this was the first significant deformation observed at a Kamchatka volcanic site. The seismic study by Senyukov (2013) detailed a new method for short-term forecasting explosive eruptions. Development for this technique began with Bezymianny datasets and was followed by a successful application to the 2010 eruption of Kizimen using the correlation between height of ash emissions and the integral of absolute velocity as recorded by local seismic stations. Elevated alert status continued through May 2013.From October 2011 through May 2013, Kamchatkan authorities maintained elevated an alert status (most frequently an Aviation Color Code of Orange) except for a few days during April-December 2012 and one day in March 2013 (figure 14). A Red level, indicating that an "eruption is underway with significant emission of ash into the atmosphere" was announced and maintained for one day in December 2011. There were several days of unassigned status during July-September 2012 primarily the result of station outages and meteorological conditions that inhibited observations which are based on satellite remote sensing, a video camera, and field visits. Figure 14. This plot of earthquakes per day at Kizimen has been annotated with Aviation Alert Levels during the time period of October 2011 to May 2013. Blue and maroon colors alternate to distinguish each month; green indicates approximate values that are based on the following scheme: background levels = 10 events/day, slightly above background levels = 20 events/day, and above background levels = 50 events/day. Note that during this time period, the Aviation Color Code varied between Orange and Yellow except where noted otherwise. Data from Kamchatka Branch of the Geophysical Service of the Russian Academy of Sciences (KB GS RAS). Observations during October 2011-May 2013. KVERT reported in regular notifications to aviation authorities (Volcano Observatory Notification to Aviation, VONA), that lava continued to extrude from the summit of Kizimen from October 2011 through May 2012. New notices of visual confirmation of lava extrusion and ash plumes were released starting on 25 October 2012 and until the time of this report in May 2013 (figure 15). Figure 15. This natural-color NASA EO-1 ALI (Advanced Land Imager) image of Kizimen was acquired on 25 May 2013. A white plume drifted E from the summit, in high contrast with the ash-covered slopes which appeared gray-brown. Outlined in a dashed yellow line is the lake that had formed in late 2011, now mostly obscurred by snow and ash (see BGVN 36:10 for a comparison). Courtesy of NASA Earth Observatory). Volcano Observatory Notification to Aviation (VONA) reports were released regularly on the KVERT website covering daily and weekly activity for Kizimen and other Kamchatka volcanoes. This reporting style was adopted by the International Civil Aviation Organization (ICAO) in 2004 "as the international warning system for volcanic ash, becoming the first 'global standardized' VALS [Volcano Alert Level Systems]. In 2006, the USGS adopted two standardized VALS, one for ground-based hazards and the other for aviation ash hazards, replacing extant VALS that had been locally developed at each observatory" (Fearnley and others, 2012; Gardner and Guffanti, 2006). At the time of this report, KVERT notifications were focused on aviation ash hazards with no additional ground-based notification system (figure 16). Figure 16. This Kizimen VONA from 27 December 2011 highlighted observed gas-and-steam plumes, visible effusive lava flows, and thermal anomalies. A forecast is also included as well as contact information for additional notices and KVERT representatives. Courtesy of KVERT. Thermal anomalies from the summit. Satellite remote sensing frequently detected elevated temperatures from Kizimen during 2011-2013 (figure 17) and a local monitoring camera maintained by KB GS RAS detected nighttime incandescence during clear viewing conditions (figure 18). Figure 17. MODIS/MODVOLC detected thermal anomalies from the summit area of Kizimen during October 2011-May 2013. Note that months without anomalies may include time periods when viewing conditions did not allow detection of elevated temperatures. Courtesy of HIGP. Figure 18. Summit emissions and incandescence from the active flow front was visible at night on 2 March 2012 from Kizimen's E flank. Courtesy of A. Sokorenko of the Institute of Volcanology and Seismology (FED RAS) and KVERT. Volcanic and seismic activity peaked in December 2011 and Red Aviation Color Code was announced on 13 December when more than 220 earthquakes were detected (figure 14). The next day, seismicity doubled and video observations showed hot avalanches from the E flank lava flow and occasional large pyroclastic flows. During 0620-0810 a large pyroclastic flow with co-ignimbrite clouds was observed. According to the Tokyo Volcanic Ash Advisory Center (VAAC), ash plumes rose 6.1-7.6 km a.s.l. Activity during 13-14 December generated an ash plume that extended ˜150 km E.
FED RAS scientists conducted an aerial survey on 23 December 2011 and determined Kizimen's range of surface temperatures (figure 19). During the overflight, temperatures were as high as 140°C, and a strong steam-and-gas plume was rising from the summit. Figure 19. Aerial photos of Kizimen on 23 December 2011 captured the active lava flow located on the E flank. (left image) This aerial image of Kizimen shows a lobate flow extending several kilometers from the summit. (right image) This thermal image depicts the active margins of effusive lava flows where elevated temperatures were concentrated; maximum temperatures were ˜140°C. Courtesy of Sergey Chirkov of the Institute of Volcanology and Seismology (FED RAS) and KVERT. Seismicity during October 2011-May 2013. After peaking with ˜870 earthquakes on 2 October 2011, seismicity peaked again on 20 February 2012 (651 earthquakes/day) before beginning a long period of decline until June 2012 (figure 14). Possible avalanche signals were typical during this time period and explosion events frequently occurred. Seismicity also included spasmodic volcanic tremor, at times continuous, but more frequently intermittent episodes; tremor became less dominant in April and was absent in May. During May-June 2012, seismicity rarely exceeded background levels (approximately 10 earthquakes/day). Spasmodic tremor was intermittent and rarely occurred during June-July, although an increase in tremor was detected during 24-30 July. Due to technical problems, there were data outages in July, the majority of August, and part of September. Tremor, explosions, and possible avalanche events were detected intermittently by the seismic network in August and September. The seismic network detected intermittent explosive and rockfall events from October 2012 through December of that year. From October 2012 through May 2013, seismicity rarely exceeded 100 earthquakes/day. Several peaks in activity occurred in late December 2012 (a maximum of 422 earthquakes/day) and January 2013 (a maximum of 322 earthquakes/day). Tremor, explosions, and rockfall events became more frequent in January 2013 and February. After that, tremor became increasingly rare and was absent in May although explosion signatures were frequently-occurring throughout that time period. By May 2013, seismicity had decreased to an average of 62 earthquakes per day. References:Fearnley, C.J., McGuire, W.J., Davies, G., and Twigg, J., 2012, Standardisation of the USGS Volcano Alert Level System (VALS): analysis and ramifications, Bulletin of Volcanology, 74: 2023-2036. Gardner, C.A. and Guffanti, M.C., 2006, U.S. Geological Survey's Alert Notification System for Volcanic Activity. In: Fact Sheet 2006-3139. U.S. Geological Survey. Ji, L., Lu, Z., Dzurisin, D., Senyukov, S., 2013, Pre-eruption deformation caused by dike intrusion beneath Kizimen volcano, Kamchatka, Russia, observed by InSAR, Journal of Volcanology and Geothermal Research, 256, 87-95. Senyukov, S.L., 2013, Monitoring and Prediction of Volcanic Activity in Kamchatka from Seismological Data: 2000-2010, Journal of Volcanology and Seismology, vol. 7, no 1, 86-97. Siebert, L., Simkin, T., Kimberly, P., 2010, Volcanoes of the World, 3rd edn. University of California Press, Berkeley. USGS Volcano Hazards Program: Volcano Observatory Notices for Aviation (VONA), 8 June 2013, (http://volcanoes.usgs.gov/activity/vonainfo.php). Accessed 13 June 2013. Information Contacts: Kamchatka Branch of the Geophysical Service of the Russian Academy of Sciences (KB GS RAS), Piip Ave. 9, Petropavlovsk-Kamchatsky, 683006, Russia; Kamchatka Volcanic Eruptions Response Team (KVERT), Institute of Volcanology and Seismology, Russian Academy of Sciences, Far East Division, 9 Piip Blvd., Petropavlovsk-Kamchatsky 683006, Russia (URL: http://www.kscnet.ru/ivs/); Tokyo Volcanic Ash Advisory Center (VAAC), Tokyo, Japan (URL: http://ds.data.jma.go.jp/svd/vaac/data/); MODVOLC, Hawai`i Institute of Geophysics and Planetology (HIGP), MODVOLC Thermal Alerts System, School of Ocean and Earth Science and Technology (SOEST), Univ. of Hawai`i, 2525 Correa Road, Honolulu, HI 96822, USA (URL: http://modis.higp.hawaii.edu/); Sergey Senukov, Kamchatka Branch of the Geophysical Service, Russian Academy of Sciences (KB GS RAS, Russia (URL: http://www.emsd.ru/); NASA Earth Observatory (URL: http://earthobservatory.nasa.gov/). 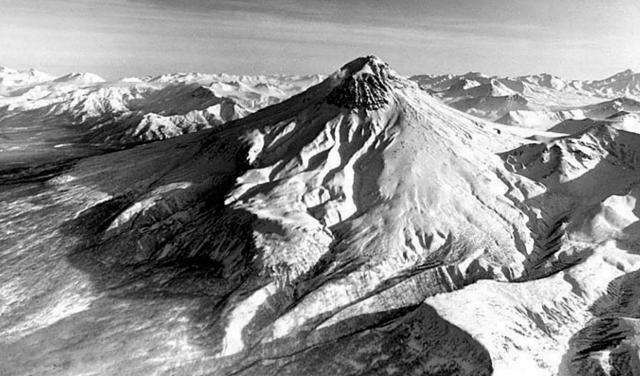 Kizimen is an isolated, conical stratovolcano that is morphologically similar to St. Helens prior to its 1980 eruption. The summit consists of overlapping lava domes, and blocky lava flows descend the flanks of the volcano, which is the westernmost of a volcanic chain north of Kronotsky volcano. The 2334-m-high edifice was formed during four eruptive cycles beginning about 12,000 years ago and lasting 2000-3500 years. The largest eruptions took place about 10,000 and 8300-8400 years ago, and three periods of long-term lava dome growth have occurred. The latest eruptive cycle began about 3000 years ago with a large explosion and was followed by intermittent lava dome growth lasting about 1000 years. An explosive eruption about 1100 years ago produced a lateral blast and created a 1.0 x 0.7 km wide crater breached to the NE, inside which a small lava dome (the fourth at Kizimen) has grown. Prior to 2010, only a single explosive eruption, during 1927-28, had been recorded in historical time. Melekestsev I V, Ponomareva V V, Volynets O N, 1995. Kizimen volcano, Kamchatka - a future Mount St. Helens?. J. Volcanol. Geotherm. Res., 65: 205-226. Reference List: Ji et al. 2013. Kizimen volcano, morphologically similar to the pre-1980 Mount St. Helens edifice, is seen from the NW. The Holocene edifice of Kizimen is composed of closely spaced extrusive lava domes with their mantling lava and pyroclastic-flow deposits. A large debris fan from the volcano partly smoothes NE-striking faults, which cut pre-Kizimen and some Kizimen deposits. Fumaroles are seen on the northern slope of the volcano, close to its summit. Copyrighted photo by Vikto Dvigalo (Holocene Kamchataka volcanoes; http://www.kscnet.ru/ivs/volcanoes/holocene/main/main.htm). Large Eruptions of Kizimen Information about large Quaternary eruptions (VEI >= 4) is cataloged in the Large Magnitude Explosive Volcanic Eruptions (LaMEVE) database of the Volcano Global Risk Identification and Analysis Project (VOGRIPA).